The National Weather Service has issued a heat advisory, in effect for all of Southeast Michigan beginning at noon today and running through midnight Wednesday. A heat advisory means that a period of hot temperatures is expected. In this case, forecasters say highs in the 90s will feel over 100 degrees in throughout the region. The National Weather Service says the hot temperatures and high humidity will combine to create a situation in which heat illnesses are more common. 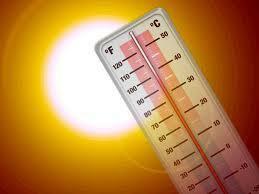 Heat stroke, heat exhaustion, muscle cramps and sun burns are possible in cases where no protective action is taken. Officials suggest you drink plenty of fluids, stay out of the sun, and stay in air-conditioned buildings whenever possible. Children and pets should never be left in vehicles under any circumstances. Doctors say symptoms like an inability to perspire, confusion and dizziness should be warning signs that you need to go somewhere cool to rest and rehydrate. This advice is especially important for senior citizens and others at high risk for heat illness - including those with diabetes, cardiovascular disease, and respiratory disorders.